The dangerous hurricane, currently at Category 3, is on a collision course for the Sunshine State. Hurricane Matthew has gained in strength and is poised to wreak havoc on the coast of Florida, the first hurricane to make landfall in the Sunshine State in more than a decade. The hurricane currently has sustained wins of 120 miles per hour, remaining a Category 3 storm despite weakening after striking Haiti and Cuba. Now, the storm’s projected path takes it to strike almost the entire east coast of Florida, moving right up the East Coast into Georgia and the Carolinas before it is expected to head out to sea. And it’s not the only storm activity in the region. Tropical Storm Nicole has strengthened south of Bermuda, although it appears likely to stay well off shore. Hurricane Matthew was about 55 miles north-northeast of Cuba as of late Wednesday morning. It has dropped in strength since topping out at a Category 4 with 145 miles per hour sustained wins, but is expected to remain a strong hurricane for a while. It is currently moving northwest at 12 miles per hour. It will continue to head that direction for the next one or two days, moving across the Bahamas and coming into contact with Florida, and would probably increase in strength between now and then. The hurricane’s destructive path has prompted tropical storm warnings and watches throughout the Caribbean and the Southeast Coast of the United States. 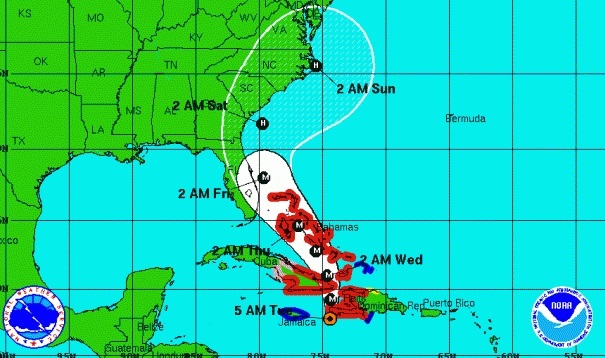 Tropical storm conditions could be expected even on the other side of Florida. Fla. Gov. Rick Scott has declared a state of emergency, and announced the partial activation of the Florida National Guard.